High speed steel bits can be easily sharpened to a very fine edge for smooth, precise cuts. HSS bits work best with softwoods/light plastics. 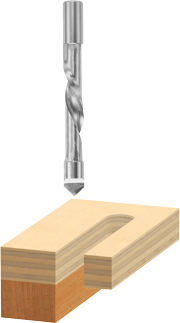 Pilot panel bit has a drill-through point that plunges through the material, and is used for cutting aluminum sheets, insulation sheeting, wall panels, plywood, and other like materials.